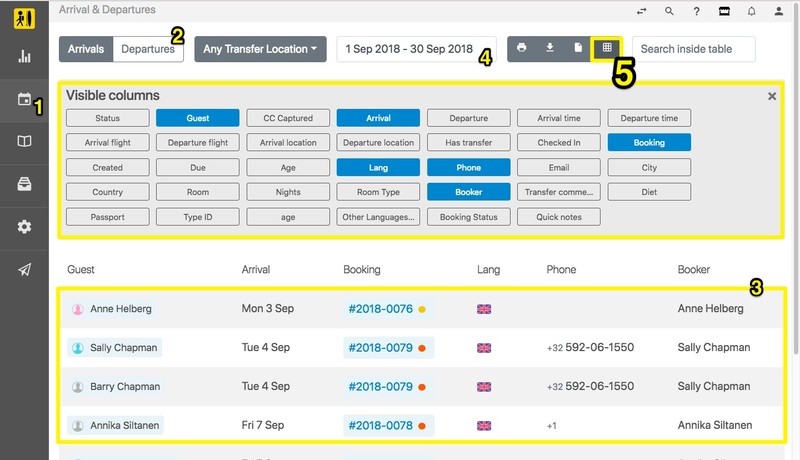 A booking is considered as having an Odd Arrival or Departure date when a guest, in the Transfer Info section of their Customer Portal, indicates that he or she will arrive or depart on a day that doesn't correspond with the booking check-in and check-out dates. You can enable/disable this setting by going to Settings > Frontoffice > Customer Portal > Allow Odd Arrivals. Please note that selecting an odd Arrival or Departure day will not change the items within the booking - in other words, the duration of the stay or the package will not be adjusted according to the actual arrival/departure. If an Odd Arrival or Departure date is selected, a warning will be displayed to prevent possible mistakes from happening. 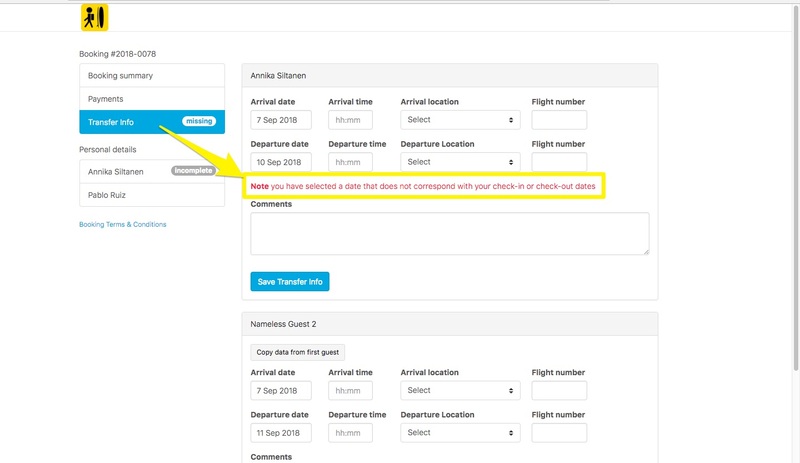 In the Planning Module (1), go to Arrivals/Departures (2), and you will see a List of Arrivals (3) within a selected Time Period (4), ordered by the most recent Arrival date. If you click on the Table Column (5), you can choose which visible columns you would like to display. Odd Arrivals will be indicated by the red icon and the text ''Odd Arrival''. Click on the name of the Guest > Transfer Information and enter the corresponding Early Arrival or Late Departure day. Please note that this way you can also keep track of your Arrivals and Departures when people that booked together arrive on different dates/times.